For the finest selection of beachfront properties with Naples Bay views and easy canal access, you need look no further than Port Royal Club Naples FL. Area residents take pride in the majestic landscaping that surrounds the community, and the properties offer deep water canals to allow homeowners to dock their yachts right in their own backyards. The canals allow for easy access to the Gulf of Mexico, and due to this unique feature, the beach front estates are highly valued. Price ranges for waterfront homes in Port Royal range from $3.5 to $20 million. Homes that border the Gulf range in price from $10 to $70 million depending on the lot’s size and specific location. Much of the larger beach front luxury estates sit on several of the original small development lots. This custom home community dates back to 1938 when Glenn Sample came to the ear in search of an easy stress and carefree lifestyle where he could fish and boat to his heart’s content. Starting with just one beach property, he built his first home, and before long over a 12 year period, he continued to buy small lots. This entire parcel of land he called Port Royal after the harbor city in Jamaica. 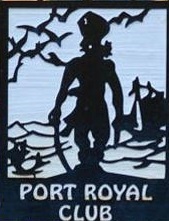 By 1948, Sample began selling lots within Port Royal for custom-built luxury properties. The first properties sold for a mere $11K. By the 1960s, home prices continued to rise, and the Port Royal Club was established to provide social and recreational amenities for its members. Eventually, the club built a restaurant and added additional lots to its offerings. The private country club on the Port Royal property offers many recreational and social activities. The club members play an active role in bring parties, guest lectures, holiday celebrations, children’s classes and fashion shows to the resident members. The club’s restaurant provides breakfast, lunch and dinner along with special evenings for buffets, grill nights, cookouts, catering and party planning. Members enjoy a pristinely-maintained sandy beach, heated pool and tennis facilities with 9 Har-Tru courts. The fitness center offers the latest exercise equipment along with certified fitness professionals for private consultations and group classes. Spa treatments also offer residents a chance to unwind and relax with the latest skin care therapies, massages and waxing. then give us a call for a private showing: (239) 719-0400.